This dish is a winner - easy, relatively quick and very tasty! TheFiancee is always nagging me to make it again! 1. Heat the butter and oil together in a large saucepan/wok-type thing. Add the onions, saute-ing over medium heat until see-through. Add the sugar and cook a few minutes more to caramelize. Add the butternut cubes as well as the chicken stock and leave to simmer with the lid on until the butternut is tender. 2. Meanwhile get your pasta cooking on another stovetop, drain and keep warm until needed. 3. In a seperate frying pan, heat a little bit of oil. Coat the chicken pieces in oil and cajun spices to taste (keep in mind the spiciness is a nice contrast to the sweet onion & butternut mixture, so don't skimp too much on the spices). Fry over high heat until just cooked (be careful not to overcook, it will dry the poor chicken out). 4. 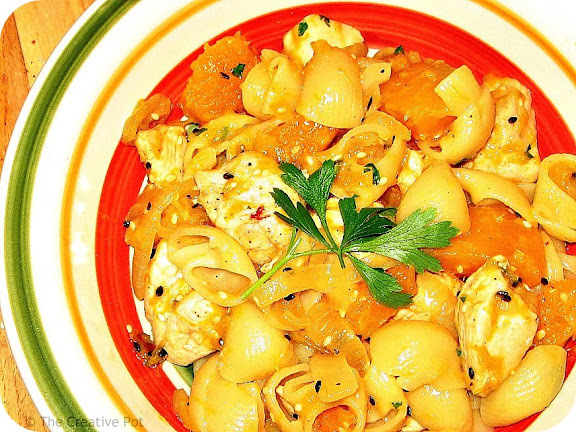 Then - toss the chicken together with the butternut & onion mix and spoon over the pasta in individual pasta bowls. Crumble some feta over, and tuck in!